The Haymaker Crankbait SR is great for 3 to 5 foot brush, rip rap rocks or stumps. 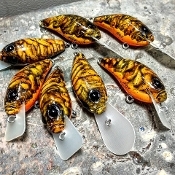 It is a old school style hunting crankbait that hunts for big bass. Bait length 2 1/2 inches and features stainless steel hardware and high quality hooks. Weight 1/2 oz for long casts.